I debated this. That is I mean I wasn’t sure I would put my degree on the wall. I put my Arrow certificate on the wall and I did the same thing…in my head that is. I look at signature lines with people who place their degrees or designations behind their name. I admire them, but I also don’t want to be seen as someone bragging. Yet these kinds of things are a great deal of work – and expense – and time doing papers and reading and papers and more reading! And being done – having completed is a very satisfying feeling. At any rate, I did put it on the wall. The truth of the matter is, it is there for me to see more than anyone else. I just feeling good having finished what I started! Of the many joys in my learning journey is discovering resources that have the potential to go on to feed further learning for years to come. Last week we dealt with material by Hugh Halter, Michael Green, Tim Keel, John Wesley and others. One of the online resources we’ve been pointed to is http://www.oikonomianetwork.org – likely this is new to you too and I would encourage you to take a look. There are many categories – including some excellent video resources as well as print. Here’s my class – now most of us are getting to the end of our MA- PT (Master of Arts in Pastoral Theology) so we won’t likely be back together. The man to the right of me is Wayne, an officer from the USA East territory. 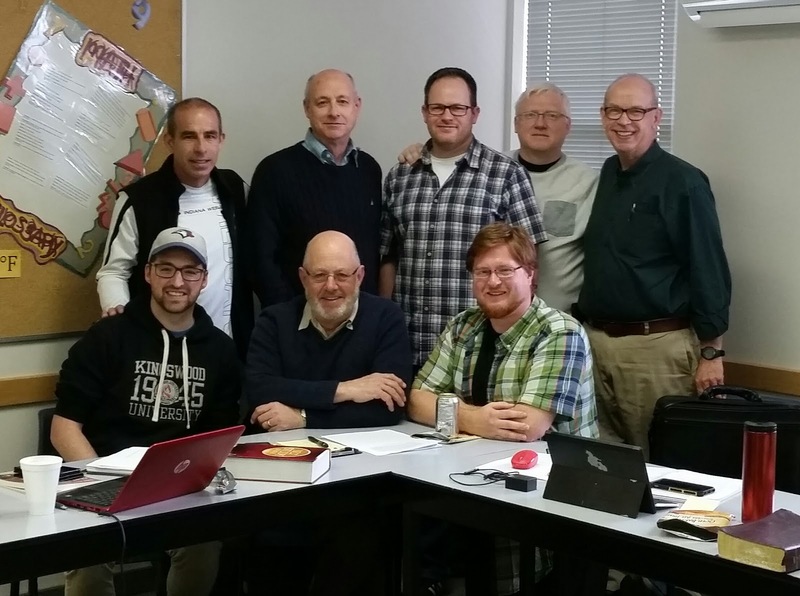 Dr. Blevins is on the far right standing – he was our professor for this last course. A crazy schedule – that’s all I can say! This has been a crazy month of demanding movement from one time zone to another….and whew! Newfoundland, Winnipeg, Vancouver now Sussex NB. This week is a return to the classroom – to Kingswood University for the final residential week – a final course before my final assignment which will complete my Master’s of Arts in Pastoral Theology. The current course is on mission and discipleship – and since I have been reading about those things “missional” for a decade this should be a good class. It is clearly a class on ecclesiology as it speaks to what the church is, and as such should be a reflection on how we have experienced church. The professor is engaging and the reading has been challenging. And I’ll be able to sit for the week and think, consider and reflect. In a month, that’s been filled with so much movement sitting still is welcome.